Large outdoor Precious Moments figurine by Universal Statuary. Made of heavy weighted weatherproof pvc material. This must be from their Garden collection by Artist Sam Butcher. 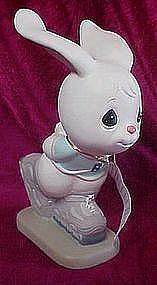 It is a rollerblading bunny. Perfect condition with original hang tag. Measures 11 1/2" tall, dated 2003. Excellent like new condition.